In a talk entitled Do Schools Kill Creativity Sir Ken Robinson gives an entertaining and moving case for creating an education system that nurtures rather than undermines creativity. It is a brilliant talk and worth listening to – you can view the full talk here. It is my experiences that in our busy, cyber space world, where we are used to receiving instant gratification many of us are not prepared to spend time learning a technique, to make a mistake, unpick a few times and persevere. No one wants to do it wrong. Ken tells us that “if you are not prepared to be wrong you will never come up with anything original”. Don’t be afraid to make mistakes – even if our teachers rapped us over the knuckles for making them in the past it is ok! 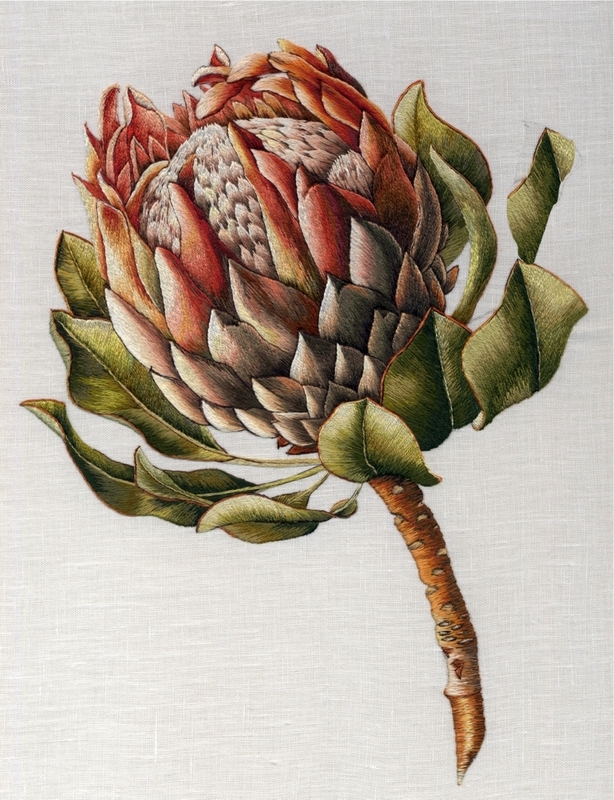 Everyone is capable of producing a beautiful piece of embroidery even if it does not follow the “rules” – it may represent a fine watercolour painting or look more like a rough oil painting but none the less beautiful. One of my first attempts at embroidery. I was quite pleased with this at the time! Embroidery at a later stage after much perseverance and practice. So the parents did take her to a dance school and it was wonderful because the school was full of people like Gillian who couldn’t sit still, people who had to move to think. In time she was auditioned for the royal ballet school, had a wonderful career there and then founded her own school, the Gillian Lynne Dance Company. She met Andrew Lloyd Webber and has since been responsible for some of the most successful musical productions in history and is a multimillionaire! The moral of the tale is that had she seen another specialist she may have been put on medication and told to calm down which would have presented a very different outcome in her life? In summarising it occurs to me that we should follow our creative urges in order to feel totally fulfilled – IF YOUR FINGERS ITCH STITCH. Don’t worry about making mistakes if you are not prepared to make mistakes you will never learn or come up with original ideas. 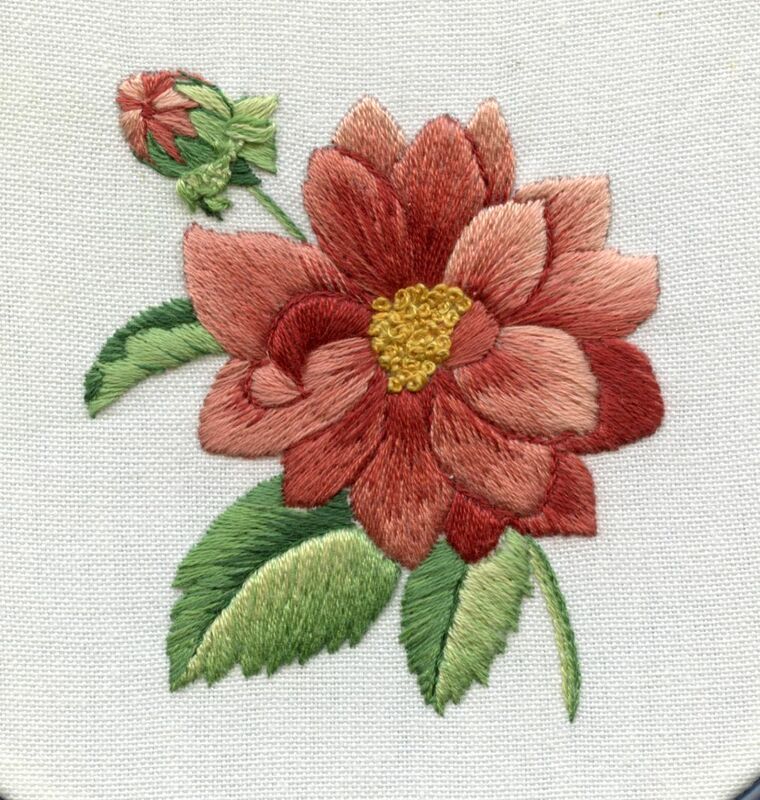 Use embroidery designers (like me) as a guide rather than try and re-create an exact replica and you will see your own unique style unfold and blossom in ways you had never expected! This is so true Trish! I make mistakes every day, but then I learn something every day too! You have been an inspiration for me, and I truly appreciate the time you take to share with all of us! what a beautiful message. thank you for putting out there what so many of us think. Although my innate creativity was fairly well stifled both by parents and by school, my father used to tell us ‘He who never made a mistake never made anything’. In recent years when I have allowed (encouraged) my creativity to flourish those words return to me. A woodwork teacher I had once said there were no mistakes only challenges to overcome. So there are different but positive ways to look at ‘mistakes’. Mistakes are OK.
My own definition of art is that it is a creative idea carried through to completion all by one person. Sorry Trish, but that means your kits are art only to you, not the people who buy and embroider them. A wonderful post. You should somehow provide a special link at the top of your web page for this one. Arts provide the links that join all humanity. We speak different languages. We do not all read and write. Some are blind, deaf or have other physical handicaps. Our intellectual abilities vary widely. We live in cultures with differing values. Yet through all this, all people throughout time appreciate forms of art. We all do something, although it may not always be visible. We all feel and respond. When I read your blog or see your work I might not always rush out and do something straight away, but the knowledge builds. My skills build. Your efforts, even when your back hurts, are definitely of continuing value to me. This post is a great reminder. What a wonderful and inspiring article. Thank you Judith glad you enjoyed it. Its true, we do value accademics more then art. Just look at the schools here in the USA. When they have to cut a program because of budget problems, it is always the art or music courses from what I have seen. And I know two amazing artists in my family and friends circle, and they can’t find work using their talents. And I can identify with the little girl who could’t sit still. I can’t just watch television. I have to be stitching or drawing or I’ll eat (which my diet doesn’t need). Needle art keeps me from being fidgety. Trish, what a lovely sentiment. I haven’t listened to Sir Ken yet, but I plan on doing so. Thanks to your encouragement, my own creativity is blossoming and I’m having lots of fun. Thank you for that. I’m also watching my own daughter create things in ways very different from my own. Her creativity knows no boundaries. It is a wonderful thing to see. I love that talk too and have listened to it several times and even talked to others who’ve heard it! It must be YouTube’s most popular vid! !=) I too was very moved by the Gillian Lynne story and went on to read his book as well. Excellent Elizabeth I love that quote! Interesting that you have listened to the talk and read the book – I think it would make a wonderful Christmas present for some members of my family who are creative, presume it can be found on Amazon? My poor husband is an accountant and surrounded by 4 women who are all creative – he kept saying “oh no not another artist” but having listened to this talk I think he sees it differently and lives in hope that one of them may reach the status of “multimillionaire” and support us in our old age!